A FESTIVAL SHOULD BE FESTIVE RIGHT? Open your festival with an impressive bang! Flutter FETTI®'s confetti launchers with Co2 cylinders will send fluttering confetti high in the air above your crowd and get them ready to celebrate. As a New Orleans-based company, every year we provide the confetti for the French Quarter Festival, a glorious April weekend of free music. The organizers use Flutter FETTI® festival confetti and streamers to energize the opening parade as well as to send off the last night's closing act with fond memories of a great three days. Our outdoor festival party decoration confetti products, designed for easy cleanup, are ideal for outdoor use because they are biodegradable and flame retardant. But Flutter FETTI® is not just for outdoor music festivals. Wherever people are, Flutter FETTI® energizes the crowd! We know how to add delight and joy to food, wine, film, and arts festivals. Welcome your guests with the WOW Effect of Flutter FETTI® festival confetti and streamers! Or use it to announce the winners of a competition. Whatever it is you're celebrating, remember that everyone in their minds links confetti with celebrations, festivals, and laughter. 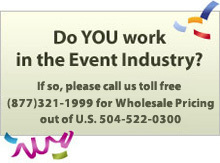 Make your event truly festive with Flutter FETTI® festival confetti and streamers!